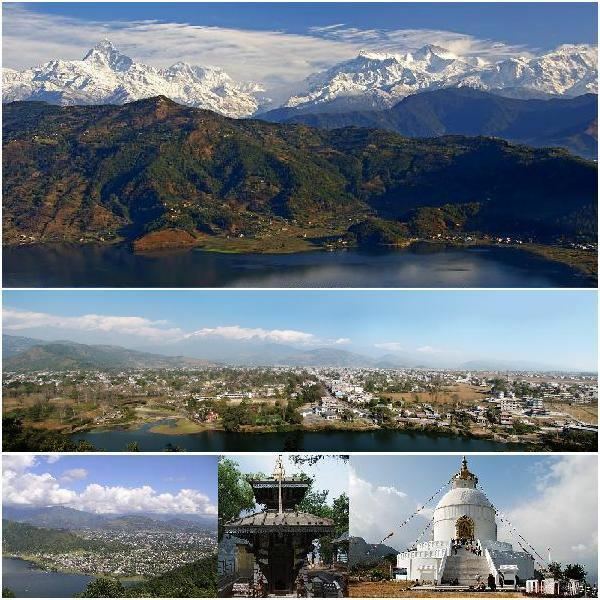 Pokhara Lekhnath (Nepali: पोखरा लेखनाथ) is a metropolis and the largest city of Nepal in terms of area. It is the provincial capital of Province number 4, headquarter of Gandaki Zone and Kaski District. It is located 200 kilometres (120 miles) west of the capital Kathmandu. Occupying an area of 464.24 km2, it is nine times larger than Kathmandu, 18 times larger than Lalitpur and 2.5 times larger than Bharatpur.The altitude varies from 827 metres (2,713 feet) in the southern part to 1,740 metres (5,710 feet) in the north. 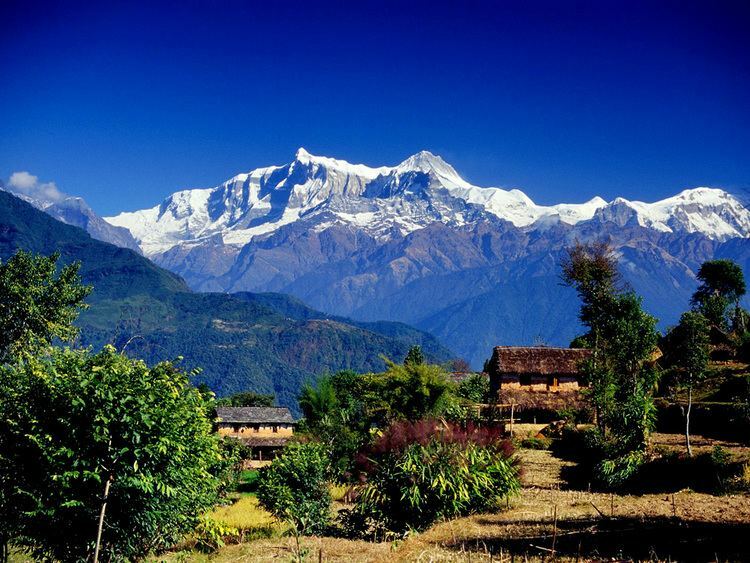 The Annapurna Range with three of the ten highest mountains in the world — Dhaulagiri, Annapurna I and Manaslu — is within 15 – 35 miles of the valley. Due to its proximity to the Annapurna mountain range, the city is a base for trekkers undertaking the Annapurna Circuit through the Annapurna Conservation Area region of the Annapurna ranges in the Himalayas. Pokhara Lekhnath is home to many Gurkha soldiers. It is the most expensive city in the country, with a cost-of-living index of 150, and the most expensive place in Nepal after Namche Bazaar. In terms of population, and is often referred to as the tourism capital of Nepal. Pokhara is in the northwestern corner of the Pokhara Valley, which is a widening of the Seti Gandaki valley that lies in the midland region (Pahad) of the Himalayas. In this region the mountains rise very quickly, and within 30 kilometres (19 miles), the elevation rises from 1,000 to 7,500 metres (3,300 to 24,600 feet). As a result of this sharp rise in altitude the area of Pokhara has one of the highest precipitation rates in the country (3,350 mm/year or 131 inches/year in the valley to 5600 mm/year or 222 inches/year in Lumle). Even within the city there is a noticeable difference in rainfall between the south and the north: The northern part at the foothills of the mountains experiences a proportionally higher amount of precipitation. The Seti Gandaki is the main river flowing through the city. The Seti Gandaki (White River) and its tributaries have created several gorges and canyons in and around Pokhara that give intriguingly long sections of terrace features to the city and surrounding areas. These long sections of terraces are interrupted by gorges that are hundreds of metres deep. The Seti gorge runs through Pokhara from north to south and then west to east; at places these gorges are only a few metres wide. In the north and south, the canyons are wider. The porous underground of the Pokhara valley favours the formation of caves and several caves can be found within city limits. In the south of the city, a tributary of the Seti flowing out of the Phewa Lake disappears at Patale Chhango (पाताले छाँगो, Nepali for Hell's Falls, also called Davis Falls, after someone who supposedly fell in) into an underground gorge, to reappear 500 metres (1,600 feet) further south. To the southeast of Pokhara is the municipality of Lekhnath, a recently established town in the Pokhara valley, home to Begnas Lake. 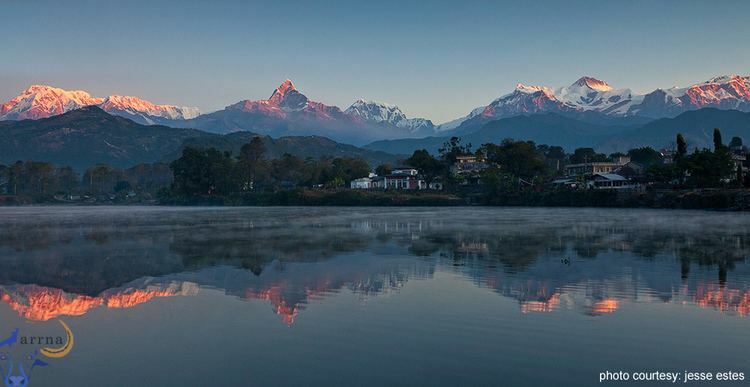 Pokhara lies on an important old trading route between China and India. In the 17th century it was part of the Kingdom of Kaski which was one of the Chaubise Rajya (24 Kingdoms of Nepal, चौबिसे राज्य) ruled by a branch of the Shah Dynasty. Many of the hills around Pokhara still have medieval ruins from this time. In 1786 Prithvi Narayan Shah added Pokhara into his kingdom. It had by then become an important trading place on the routes from Kathmandu to Jumla and from India to Tibet. Pokhara was envisioned as a commercial center by the King of Kaski in the mid 18th century A.D. when Newars of Bhaktapur migrated to Pokhara, upon being invited by the king, and settled near main business locations such as Bindhyabasini temple, Nalakomukh and Bhairab Tole. Most of Pokhara, at the time, was largely inhabited by Khas (Brahmin, Chhetri, Thakuri and Dalits), the major communities were located in Parsyang, Malepatan, Pardi and Harichowk areas of modern Pokhara and the Majhi community near the Phewa Lake. The establishment of a British recruitment camp brought larger Magar and Gurung communities to Pokhara. At present the Khas, Gurung (Tamu) and Magar form the dominant community of Pokhara. There is also a sizeable Newari population in the city. A small Muslim community is located on eastern fringes of Pokhara generally called Miya Patan. Batulechaur in the far north of Pokhara is home to the Gandharvas or Gaaineys (the tribe of the musicians). The nearby hill villages around Pokhara are a mixed community of Khas and Gurung. Small Magar communities are also present mostly in the southern outlying hills. Newar community is almost non-existent in the villages of outlying hills outside the Pokhara city limits. Pokhara is known to be a popular tourist destination. The tourist district is along the north shore of the Phewa lake (Baidam, Lakeside and Damside). It is mainly made up of small shops, non-star tourist hotels, restaurants and bars. Most upscale and starred hotels are on the southern shore of the Phewa Lake and southeastern fringes of the city where there are more open lands and unhindered view of the surrounding mountains. Most of the tourists visiting Pokhara trek to the Annapurna Base Camp and Mustang. To the east of the Pokhara valley, in Lekhnath municipality, there are seven smaller lakes such as Begnas Lake, Rupa Lake, Khaste lake, Maidi lake, Neureni lake, Dipang lake. Begnas Lake is known for its fishery projects. In recent decades, Pokhara has become a major tourist destination: It is considered the tourism capital of Nepal in South Asia mainly for adventure tourism and the base for the famous Annapurna Circuit trek. Thus, a major contribution to the local economy comes from the tourism and hospitalities industry. Many tourists visit Pokhara. Tourism is a major source of income for local people and the city. There are two 5-star hotels and approximately 305 other hotels that includes five 3-star, fifteen 2-star and non-star hotels in the city. Many medieval era temples (Barahi temple, Bindhyabasini, Bhadrakali, Talbarahi, Guheshwori, Sitaldevi, Gita mandir temple, Bhimsen temple) and old Newari houses are part of the city (Bagar, Bindhyabasini, Bhadrakali, Bhairab Tol, etc.). The modern commercial city centres are at Chipledhunga, New Road, Prithvi Chowk and Mahendrapul (recently renamed as Bhimsen Chowk). The city promotes two major hilltops as viewpoints to see the city and surrounding panorama, World Peace Pagoda built in 1996 across the southern shore of Phewa lake and Sarangkot which is northwest of the city. In February 2004, International Mountain Museum (IMM) was opened for public in Ratopahiro to boost the city's tourism attractions. Other museums are Pokhara Regional Museum; an ethnographic museum; Annapurna Natural History Museum which houses preserved specimens of flora and fauna, and contains particularly extensive collection of the butterflies, found in the Western and ACAP region of Nepal; and Gurkha Museum featuring history of the Gurkha soldiers. Since the 1990s Pokhara has experienced rapid urbanization. As a result, service-sector industries have increasingly contributed to the local economy overtaking the traditional agriculture. An effect of urbanization is seen in high real estate prices, among the highest in the country. The major contributors to the economy of Pokhara are manufacturing and service sector including tourism; agriculture and the foreign and domestic remittances. Tourism, service sector and manufacturing contributes approximately 58% to the economy, remittances about 20% and agriculture nearly 16%. There are more than 250 tourist category hotels and lodges in Pokhara of which two (the Fulbari Resort and Pokhara Grande) are ranked 5-star. Pokhara provides lodging and fooding from backpackers to deluxe ranges. Pokhara is the major tourism Hub in Nepal. Tourism plays a vital role in Pokhara since thousands of tourists visit Pokhara every year and majority of people are involved in the tourism sector. There are many trekking agencies in Pokhara that provide several trekking programs and itineraries for the tourists. Some of the major trekking regions are Annapurna region, Everest region, Langtang region, Manaslu region, Rara/Jumla region and Kanchanjanga/ Makalu region. One of the oldest trekking agencies in Pokhara is Sisne Rover Trekking located in Lakeside that has been serving its customers since 25 years. Similarly, many other trekking agencies are available to help make the trekking experience remarkable and enjoyable. Pokhara region has a very strong military traditions with significant number of its men being employed by the Nepali army. The Western Division HQ of the Nepalese Army is stationed at Bijayapur, Pokhara and its Area of Responsibility (AOR) consists of the entire Western Development Region of Nepal. The AOR of this Division is 29,398 km2 and a total of 16 districts are under the Division. The population of the AOR of Western Division is 4,571,013. Both British Army and the Indian Army have regional recruitment and pensioners facilitation camps in Pokhara. The British Gurkha Camp is located at Deep Heights in the northeast of the Pokhara city and the Indian Gorkha Pension Camp is in the south-western side of the city, Rambazar. Pokhara has extensive privately operated public transportation system running throughout the city, adjoining townships and nearby villages. The public transport mainly consists of local and city buses, micros, micro-buses and metered-taxis. The sporting activities are mainly centered in the multipurpose stadium Pokhara Rangasala (or Annapurna Stadium) in Rambazar. The popular sports are football, cricket, volleyball, basketball etc. The Sahara Club is one of the most active organizations promoting football in the city and organizes a South Asian club-level annual tournament: the Aaha Gold Cup. Additionally, the Kaski District Football Association (KDFA) organizes Safal Pokhara Gold Cup, which is also a South Asian club-level tournament and ANFA organizes local Kaski district club-level Balram KC memorial football tournament. B-13, Sangam & LG are the power house Football club in Pokhara. There are several tennis courts and a golf course in the city. Nearby Sarangkot hill has developed as a good attraction for adventure activities such as paragliding and skydiving. The Pokhara city marathon, high altitude marathon are some activities attracting mass participation. Adventure sports such as base jumping, paragliding, canyoning, rock climbing, bungee jumping, etc. are targeted towards tourists. An additional 4 FM stations from Kathmandu have their relay broadcast stations in Pokhara, making a total of 22 FM stations. Among them there are six Community radio Stations, They are Himchuli FM - 92.2 MHz, Gorkhali Radio -106 MHz, Samudayik, Radio Sunaulo F.M - 107.2 MHz and Radio Gandaki 90.2 MHZ, Radio Hemja 88.5 MHz. There are four local television stations: GoldenEye Television, Pokhara Television, Gandaki Television and fewa television. Approximately 14 national daily newspapers, in Nepali are published in the city along with several other weekly and monthly news magazines. All major national newspapers published in Kathmandu have distributions in Pokhara. A number of online news portals are also updated from Pokhara. Recentfusion.com, Safalnews.com, Citypokhara.com, Mainkhabar.com, Ganthan.com, Peacepokhara.com, Barahinews.com, Pokharanews.com are some of them. Some entertainment-based websites are also based in Pokhara. Popular technology based web-magazine TechSansar also started from Pokhara city. Pokhara has got 4G network of Nepal Telecom and 3G network of Ncell. Majority of the people in the city access internet through mobiles, numerous cyber cafes and local wireless ISPs. Most tourist restaurants and hotels also provide WiFi services. Wi-Fi hotspot by Nepal Telecom using Wi-MAX technology, started in Feb. 2014, is accessible in most parts of the city for a fee. Subscriber based internet is provided by several private ISP providers in Pokhara namely Worldlink, Pokhara Internet, Subisu, Websurfer, Radius Communication.